SINGAPORE - Crocodiles lazing in the waters are a common sight for visitors to the Sungei Buloh Wetland Reserve in north-western Singapore. Recently, however, these reptiles have been spotted basking in the sun in other parts of the island too. The National Parks Board (NParks) said in response to queries from The Straits Times that it was alerted to two recent sightings of crocodiles at Pasir Ris Park. The first sighting took place on Aug 1. Retired engineer and photographer Ted Lee, 60, had spotted a roughly 2m-long crocodile sunbathing on the mudflat of Sungei Tampines in Pasir Ris Park at about 4pm. 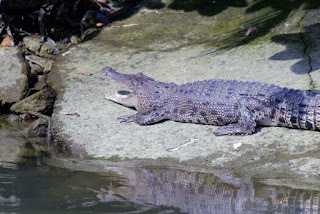 "This is the first time I have seen a crocodile at Pasir Ris Park. I knew only that there were crocodiles at Sungei Buloh, but not here. When I saw it, it was sunbathing among the herons. But it moved away after three school students took photos of it and made lot of noise," Mr Lee told The Straits Times. Sungei Buloh Wetland Reserve is separated from areas such as Pasir Ris by the Causeway, which blocks the flow of water. However, estuarine crocodiles are known to swim freely in the Johor Strait, said Mr Chia Seng Jiang, NParks' group director for parks. There was another crocodile sighting on Aug 5 in the waters off the beach area of the park, he added. Last month, a video of a crocodile swimming in the waters off Sembawang was also circulated online. Estuarine crocodiles usually feed and rest in mangroves and freshwater bodies. The animals face threats due to the destruction of their habitats and over-hunting for their hide, which is often used to make shoes and handbags. Mr Chia assured visitors that the animals are usually found in the water or at mudflats located away from visitor routes. However, NParks is monitoring the sightings and will take steps to move the crocodiles elsewhere, should they continue to venture into publicly accessible areas at Pasir Ris Park, he said. Warning signs and advisory notices have also been put up in the park near water edges. Visitors who come across a crocodile should stay calm and back away slowly. They should not approach, provoke, or feed the animal. Visitors can also call the NParks helpline at 1800-471 7300 for assistance.